Mysterious flying objects of all shapes – round, ellipsoid, rectangular and triangular – can often be spotted near Lake Gaipo in the Cordilleras. Locals see them flying into the water of the lake or hanging above the water surface and then disappearing in the sky. Unlike ufologists, the Quechua Indians living on the shores of Gaipo Lake do not associate such phenomena with extraterrestrial beings. They are certain that witches and wizards assume the similitude of UFOs as they hunt for humans. Legend has it that a beam of light from a luminous object struck an Indian once. The man could not move a finger until the UFO vanished in the air. Another legend tells the story of a woman who was picking brushwood in the forest when she suddenly saw a disk of fire hanging above the lake. The disk was producing enormous heat that the woman could feel although she was standing quite far from the object. Gaipo is not the only killer lake in the world. A strange incident took place in October 1994 on John D. Long Lake in South Carolina. A young woman named as Susan Smith was convicted of murdering her two little sons. Susan left the boys, 3-year-old Michael and 14-months-old Alexander in her car and let it roll into the lake drowning the boys. Susan was sentenced to life in prison. The tragedy became a huge shock for the local population, and the people erected a monument on the pier in memory of the two children. The nightmare repeated again two years later, when a car with seven people inside – three adults and four children – suddenly took off, drove between the monuments to Alex and Michael and fell into the lake. All passengers of the car died in the accident, including another man who jumped into the water in an attempt to rescue at least someone. The stories made the local population believe that the lake had been cursed. Several dozens of cars drowned in Lake Whitney in Texas. All of the cars with passengers inside rolled into the lake from piers. Divers found some of the cars of the bottom of the lake, although they never found any human remains. Local police officers say that many of those cars could not roll into the water because they were on a parking brake. 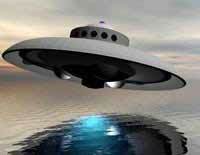 Ufologists say that two unidentified flying objects landed on the lake during the first half of the 1970s. Is there any connection between UFOs and mysterious deaths? UFO’s are usually attracted to geopathogenic zones. It is not ruled out that the electromagnetic fields of such zones affect man-made objects and humans, which eventually results in tragic accidents. UFOs may also be the source of pathogenic radiation.